High Dining takes the subtle and complex nature of cannabis and creates an artform around cannabis-infused fine dining in one of the world’s mostinspirational settings. It shuns the emphasis on getting as high aspossible in favor of a refined approach to creating elevated mood states that will enchant and inspire you. 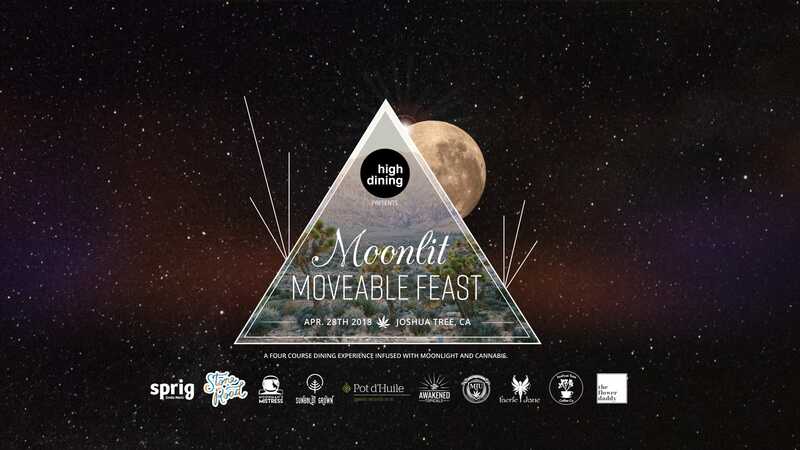 Moonlit Moveable Feast takes place, first of all, only on a fullmoon, outdoors in the legendary pastel colored deserts of JoshuaTree California. Meticulously art directed in every detail, the Feast indulges all your senses from the moment you arrive - live glass blowing, performers, artists, installations and musicians, all in a venue famous for its lavish eclecticism. Chef Sabrina Phelps, well known amongst celebrity clients, creates imaginative dishes of delicately balanced flavors, which this season, appropriately enough, will feature the flavors of Southern California Spring. Mushroom Garlic Cashew Cream and Leek Tart with an Herb Salad (hemp sprouts, chervil and chives) dressed in Pot d'huile (strainspecific cannabis-infused olive oil) as garnish. STARGAZER - An education on cannabis flower pairing guided by Cannabis Sommelier, Philip Wolf of Cultivating Spirits with flower provided by Sunshine Johnston of Sunbodlt Grown . Lemon poppyseed cakelettes served with Joshua Tree Coffee Company 's finest selections. But then again, aren't they all? Moonlit Moveable Feast is conceived and run by a couple of the California desert’s most remarkable women (Barbie Sommars and Lindsey Jones), Moonlit Moveable Feasts are about more than classy dining with a sophisticated upmarket social circle. Barbie Sommars says, “We are steeped in the mystical, as well as in the science and culture of Cannabis.” Indeed they provide an expert-curated experience that opens your eyes to its history and origins as well as to the study of its chemistry today . Other expert guests share their knowledge on the spectacular desert ecology, astronomy & the cosmos, desert arts, the exploding desert music scene and more. Matt Adams of The Blanktapes provides a psychedelic soundtrack for an epic journey to the Moon. Kyle Simon leads our guests in a audible dialogue with the Moon with his project, "The Sirens", essentially a sound telescope. Lady NeJanna provides Angel Oracle Readings to connect guests with their guardian angels. Keiko Beatie of Greenwave Relations on the topic of anything Cannabis. Keiko is also our Hostess for the evening. Ashley Manta will share with you what it means to be a Cannasexual. Trust us, you want to know. Sunshine Johnston of Sunboldt Grown just may have a seed of knowledge for you! MoonMan's Mistress shares her knowledge of cannabis and samples of a custom creation made in honor of the pink moon. Visit the Mary Jane University Vape Lounge and puff on the latest in vaporizer technology. We serve approximately 10mg of ingestible THC throughout the event and do offer other options such as smoking or vaping. The event is strictly 21 and over.